It seems that no matter what revolution in technology takes place, things always seem to make a full circle. As of a few years ago, the race was on to get to the cloud as quickly as possible. However, in the last couple of years, the cloud wants to come down to on-premises! Things have certainly went full-circle. The big public providers such as Amazon AWS and Microsoft’s Azure have been the leaders in the field for their cloud offering and Infrastructure as a Service offerings in particular. Amazon has dropped a bombshell on the cloud community and on-premises enterprise datacenters by announcing Amazon AWS Outposts to Run AWS VMware Cloud on AWS on-premises. Let’s take a closer look at this new offering from Amazon AWS and see the perspective use case for this type of environment and infrastructure and how it weighs into the mix with such solutions as VMware Cloud on AWS. The VMware variant allows you to run VMware Cloud on AWS locally on Outposts to use the same VMware control plane and APIs you use to run your on-premises infrastructure. This variant delivers the entire VMware Software-Defined Datacenter (SDDC) – compute, storage, and networking infrastructure – to run on-premises using AWS Outposts and allows you to take advantage of the ease of management and integration with AWS services. While this announcement from Amazon was shocking today and is being seen as sending shockwaves through enterprise datacenters after the announcement, Amazon really isn’t the first to do this. We all know and have heard about Azure Stack. This is a very similar offering to what Azure Stack is, however, with Amazon being the market leader in cloud and having exceptionally strong ties and relationships with powerhouse companies such as VMware with the VMware Cloud on AWS offering, Amazon is always the one that everyone is watching and trying to play catch up to. Amazon AWS Outposts is unique however, in that Amazon is partnering specifically with VMware to deliver their Cloud on AWS to on-premises environments and also to deliver their own native Amazon environment, on-premises. We are really starting to see a renewed focus back on-premises from the enterprise as well as from the big players in the field of virtualization and cloud themselves. VMware has a new beta service that you may have already heard about called Project Dimension that is an Infrastructure-as-a-Service offering from VMware where they bring VMware infrastructure on-premises to your edge environment, provision the hardware and software, fully manage and monitor the solution, as well as take care of patching and full life cycle management. In this way, customers in these newly significant edge environments where massive amounts of data are being harvested and gathered thanks to the flood of data driven devices such as IoT and others. Many of these edge environments are not good candidates to send data to the cloud either due to latency requires, connection reliability or other reasons. So, it is obvious that VMware is one among many companies seeing where the pendulum is swinging and the edge environments are a massively growing sector among enterprise IT. The unique relationship between VMware and Amazon AWS has, IMHO, helped to pave the way for Amazon to do this. It sweetens the deal of what enterprises can do with the on-premises version of AWS. Most enterprise environments today are running VMware in their SDDC environments and have been for quite some time. This familiarity with VMware products and methodologies will certainly help organizations see very quick time to value and understand the benefits of being able to hybridize their VMware environments with AWS on-premises. While there may be latency restrictions that have prevented some workloads from being natively placed in AWS, organizations may want and need the API driven control and management plane they are used to working with in AWS. By having VMware Cloud on AWS Outposts, they get the best of both worlds delivered to their on-premises datacenter. Fully managed physical and virtual infrastructure – Mirroring the way that VMware is managing the VMware Cloud on AWS infrastructure and environemnts for customers today, the VMware Cloud on AWS outposts will allow the same type of fully managed solution. VMware SREs will monitor the environments from top to bottom. Any upgrades/patches will be coordinated with customers who have the ability to create blackout periods or other factors that affect when these maintenance operations are carried out. The tremendous benefit here is that customers are able to be relieved of the burden of management of the underlying physical and virtual infrastructure, and concentrate on applications and services they want to deliver. Enterprise Hardware spec’ed by Amazon/VMware – Similarly speced M5a/M5, C5, R5, R5a) EC2 instances will be represented in physical form. These can be scaled from a single entry-level server and then scale as their business needs change over time. This can extend to multiple racks full of AWS equipment. Sub-rack units are available as well. Single Pane-of-Glass Management – The VMware Cloud Console will manage the on-premises version of VMware Cloud on AWS Outposts instances. Additionally, customers can also manage their existing VMware infrastructure as well as VMware Cloud on AWS, and Project Dimension managed edge deployments. Network Resiliency – Customers will configure either a direct connection to AWS from on-premises or utilize a VPN to the AWS region geographically closest to them. Any failures of network connectivity between the on-premises and cloud environments will self-heal in a sense in that events and metrics will be replayed to the cloud after connectivity is reestablished. Additionally, the environment will be able to run on its own without connectivity during the isolated state. Familiar VMware SDDC – Customers who are already familiar with VMware Cloud on AWS will have no problems with the new AWS Outposts offering. The same vSphere UI and API will be available for consumption. The same tooling such as the vSphere API, SDKs and CLIs will be able to operate the VMware Cloud on AWS Outposts offering. 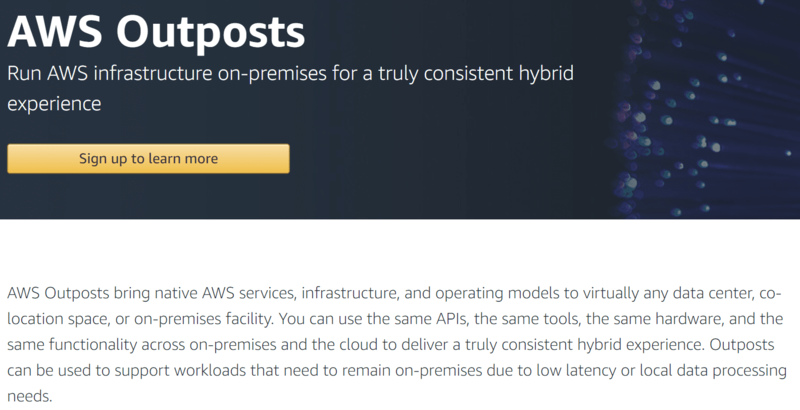 Native extension of VMware Cloud on AWS – the on-premises AWS Outposts offering will natively integrate with the VMware Cloud on AWS running in the cloud. This will allow extremely powerful functionality such as bursting workloads up into the cloud during DR, or other situations. Run native AWS EC2 instances on-premises – Customers can also run native AWS EC2 instances on-premises. Any EC2 instances that may need to have low-latency connectivity to on-premises resources may be a great fit for running inside the AWS Outposts infrastructure. It will be a process of getting the hardware on-premises and then migrating workloads. VMware Migration Center will be used to seamlessly migrate workloads from existing vSphere infrastructure to VMware Cloud on AWS Outposts. VMware HCX is used as the underlying technology to perform the migration. VMware HCX delivers secure and seamless app mobility and infrastructure hybridity across vSphere 5.0+ versions, on-premises and in the cloud. Customers can also enable and consume pre-installed VMware Cloud Foundation software from the EC2 cloud console. Utilizing VMware NSX, customers will be able to connect environments with EC2 workloads, AWS Outposts workloads and on-premises networks. Network security by way of microsegmentation will be possible with the application of relevant security policies across all the various workloads. Customers will be able to use AppDefense as well as data protection APIs that are compatible with EC2 instances. This all comes with the benefits of a unified management platform as well as a common application development platform. How will VMware Cloud Foundation for EC2 be deployed? With the click of a button from the VMware Cloud Console, customers will be able to deliver VMware Cloud Foundation for EC2 capabilities for current EC2 workloads. The news of Amazon AWS Outposts to Run AWS and VMware Cloud on AWS On-premises has certainly sent shock waves through the IT community from the release of the news. Having native AWS EC2 instances running on-premises as well as having the ability to run an on-premises version of VMware Cloud on AWS will allow having a single management platform for the entire SDDC stack from VMware to AWS, on-premises and cloud in both cases. There has certainly seemed to be a revolution in focus from the enterprise and public cloud vendors to a renewed attention to on-premises and edge environments. It will be interesting to see how this affects hypervisors across the board and how customers are willing to run workloads over the next couple of years. More information to come on VMware Cloud on AWS Outposts.